All of the overwhelming emotions are normal. Don’t worry if he/she doesn’t poop in two or three days. A week is when you should be worried. Sleep when the baby sleeps. Yes, do it. No, you will not have a “ton of free” time with a new baby. That last one should have been a no-brainer for me. But as a new momma, I thought for sure I would get SO MUCH done as a stay-at-home mom…..nope. I still did all of our laundry on Saturdays when my husband was home, struggling to make dinner each night, and falling asleep in the afternoon with the baby. My “quiet time” was nonexistent. It was a rude awaking to have to care for someone ALL DAY LONG. The things I loved to do were pushed to the side. At first I was ok with it. Until my quiet time was one of the things I pushed aside. Suddenly I felt out of touch from God and spiritually I was became dry. In the dry season, I became so thirsty, but also discouraged because I couldn’t figure out when or how to find time to meet with God. I felt like I was tired all of the time and this little human took up ALL of my “extra time.” I can’t remember what exactly changed, only I knew something needed to change. Maybe it was when I was so irritable and crying all of the time, but I remember just starting small. I began reading a simple Bible reading plan – just three chapters a day. I began to attend a local Bible study at my church to help me dig deeper. As the months, then the years passed, I changed my “quiet time” with the addition of each child and shift of seasons. I did different things – did it in the mornings, did it in the afternoons, did it in the evenings. I don’t believe there is a perfect way to balance motherhood and devotional time. I only know it MUST BE DONE. I read an article a few years ago. It spoke to my heart with the idea that motherhood is hard no matter how many kids you have. My life with four children is a lot different, and sure, having just one child is SUPER easy, but it wasn’t at the time. I remember the struggles and heartaches associated with my first born. The beautiful thing about God’s Word is that it is always the same. So no matter your season now, or the season awaiting around the corner…our God remains the same. 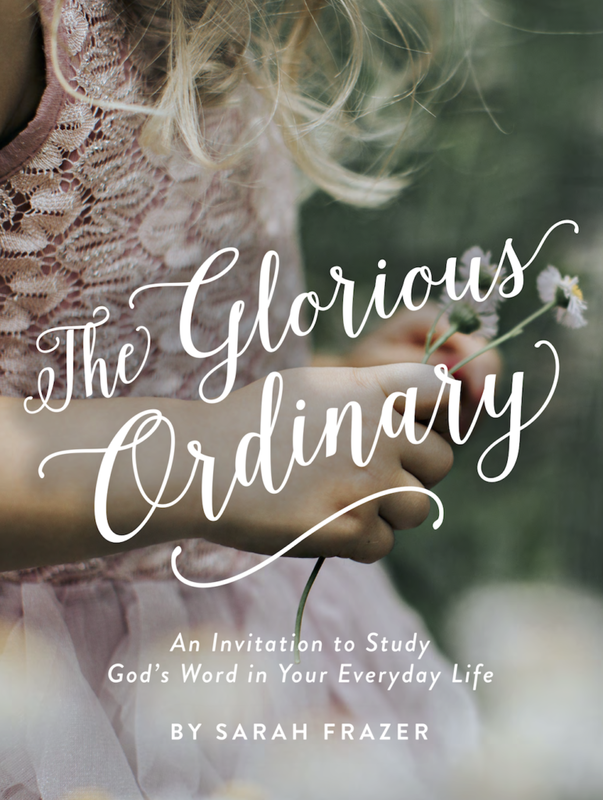 There is not step-by-step method for studying the Bible as a mother, but these tips have helped me stay focused. The steps I lay out here are for you to use, shift, and adjust to fit YOUR life. Step 1 – Get rid of the distractions you can. We can’t just “get rid” of the kids….so I try and get rid of at least the distractions I can control. I get up early because it is the best time, but I find I’m still distracted. So I put away my phone, turn off my computer and just open my journals and God’s Word. I also spend the mornings dreaming and writing. It has been a hard habit to develop, but I have succeeded so far because I know I am a better mom if I get less sleep and have quiet time. Step 2 – Make a plan. Decide when you want to do your quiet time and make it a priority. Also choose a Bible reading plan so you aren’t just opening up God’s Word and reading here and there. Right now I’m reading through the Psalms. 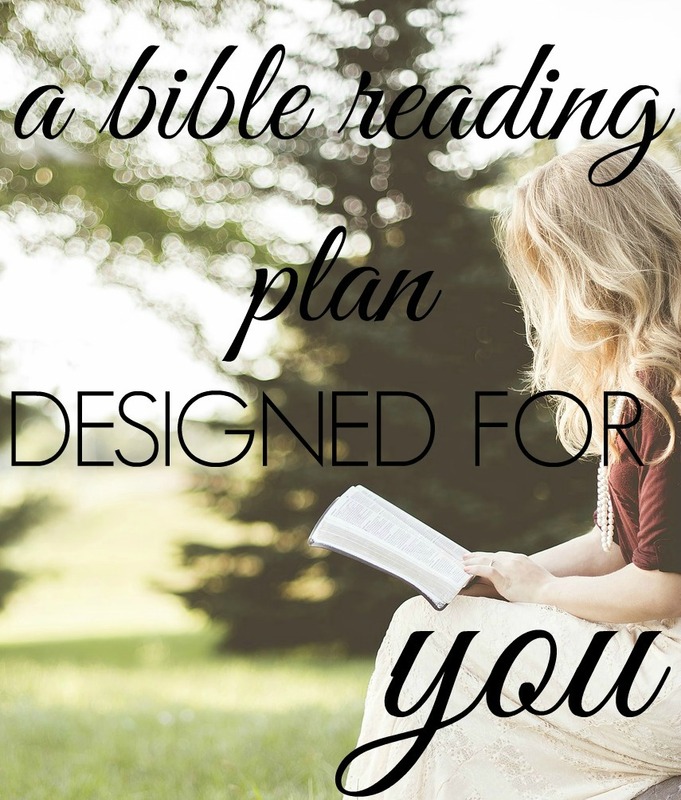 I’ve also used this Bible reading plan to read through the entire Bible (not in a year!) I would also suggest you find a good Bible study. I have a couple of devotional series below if you want to check them out. – Don’t forget – we are starting our own Balanced Motherhood Devotional Series in March! Sign up here! Step 3 – Invest in some good music and earbuds. On the days I couldn’t get up, or when a kid woke up early, or when I need some extra quiet time during the day, I use my music. I plug in my earbuds, get the kids either laid down for nap, watching a show, or reading some books. Here is my playlist for Bible study. I set a timer to let them know how long I need to work and I get busy. It helps break up my day and gives me just that extra boost of energy in the afternoon to make it until bedtime. BONUS STEP – One last thing. 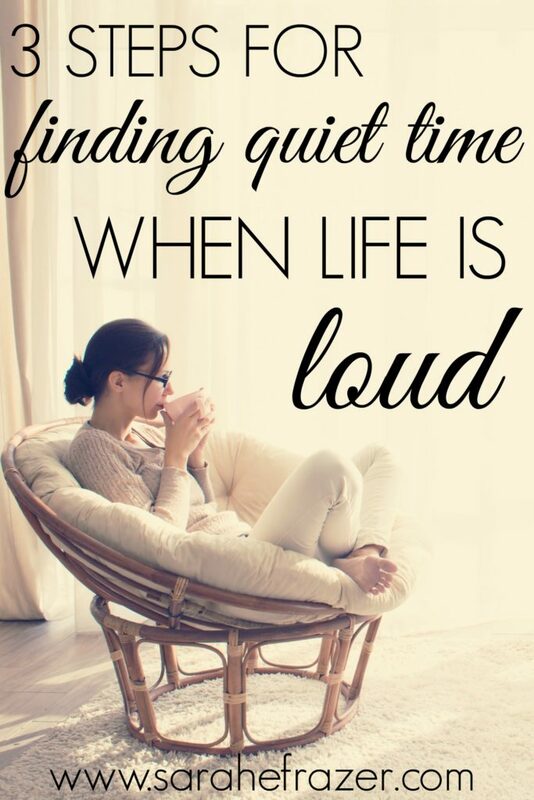 Don’t fret about the perfect quiet time experience. Trust God to meet you right where you are. I don’t always spend a ton of time in prayer or Bible study. I sometimes find my mind filled with distractions or a lack of direction. No matter what, I try to fill my heart with at least one verse for the day – and have found God is enough, in even just that. What about you? How do you have quiet time with your little (loud) ones? How do you find balance with your quiet time? Do you need help finding balance? Join me! 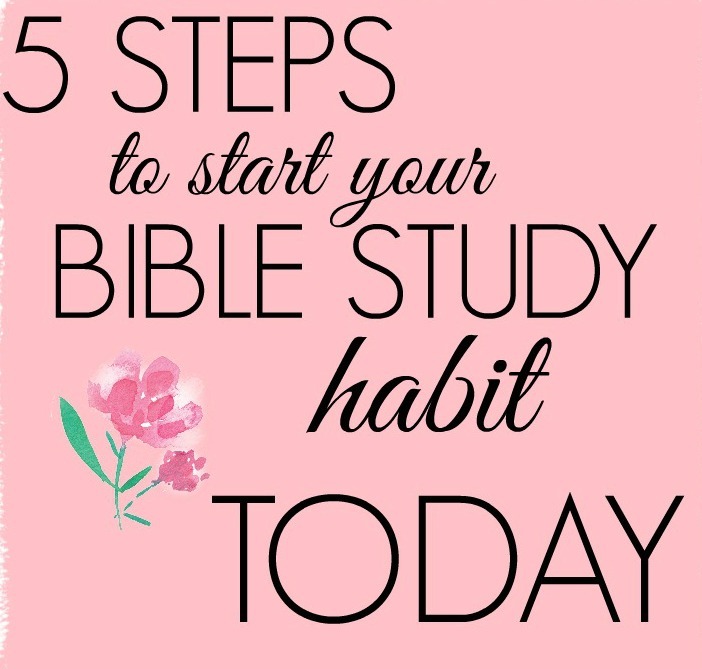 Some other great resources to help you get started with Bible study! I have developed the perfect plan for reading through the Bible! It is proven to help you keep track and keep going in your Bible reading! Download your copy here! 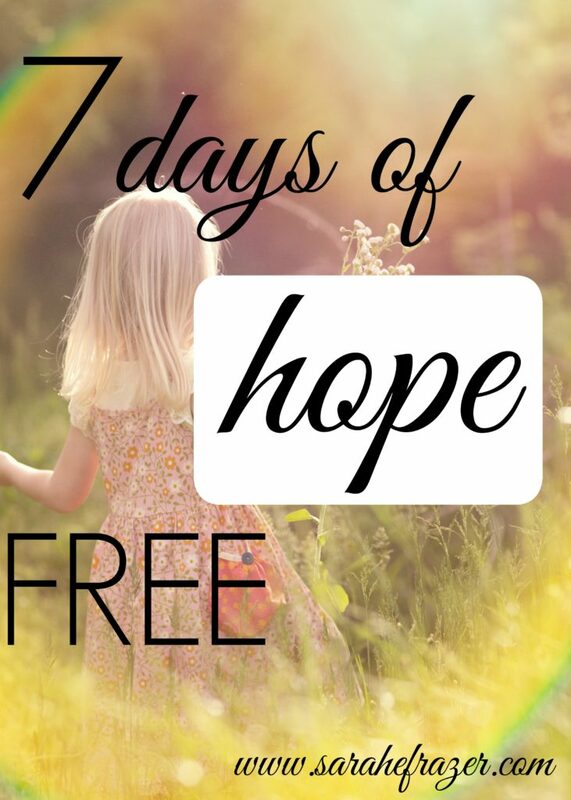 Receive a 7 Day Devotional Series filled with HOPE. – Hope-filled Bible verses will be sent straight to your inbox. Do you know for sure that you are a Christian? 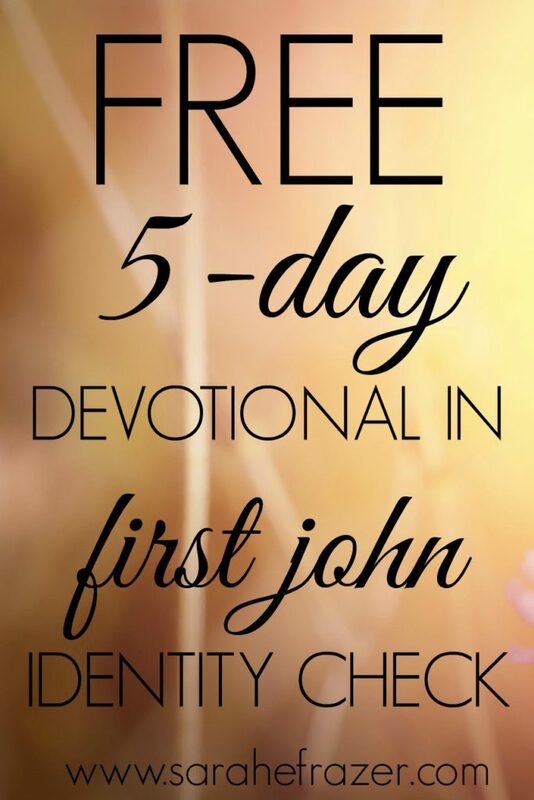 Here you will find the answer to that question in a 5-Day Devotional Series in 1 John. The book of First John tells us how we can know FOR SURE! Join me was we walk through what the Bible says about our Identity in Christ! Thank you, Sarah, for sharing some tips and encouragement for quiet time. I am not a mother, but even I find that, as you say, quiet time is a “hard habit to develop.” Plain and simple. It requires a lot of discipline, and sometimes my flesh is weak :). I stumbled across your blog thanks to Sitting Among Friends, and my own most recent post actually examined Jesus’ own habit of quiet time in the Gospel of Mark (www.faithhopeloveandwine.com/why-you-should-schedule-some-quiet-time-today/). I was delighted, then, to read your own reflection on the struggles and blessings of taking time with the Lord. Pinned! Thanks for the great advice. I love how you share practical advice while encouraging moms to recognize the freedom that God will meet us where we are. Thanks for sharing at #ThreeWordWednesday. This is terrific, Sarah! I couldn’t wait to finish reading so I could send it to my youngest daughter who is a brand new first time mommy. Sometimes as new moms, we feel consumed and isolated by those little “bundles of joy”. Thank you for expanding your love and wisdom beyond your own little ones! I got married last year and we don’t have kids yet. But I find even being married means I’ve needed to change the way I do quiet time (I used to live by myself before my husband moved in). I’m a creature of habit, and any change takes a while to get used to. But I love your bonus point – that God meets us right where we are. It’s not about a particular style of quiet time, it’s just about taking that time to meet with God, in whatever way we can. A great post, thanks! That first baby is a shock to the system! Although that was easy compared to having another one 16 months later. My first baby was the easiest guy ever. My second…well, he was the opposite. Finding small moments of peace is key to getting through it with fewer tears (from Mom! ).